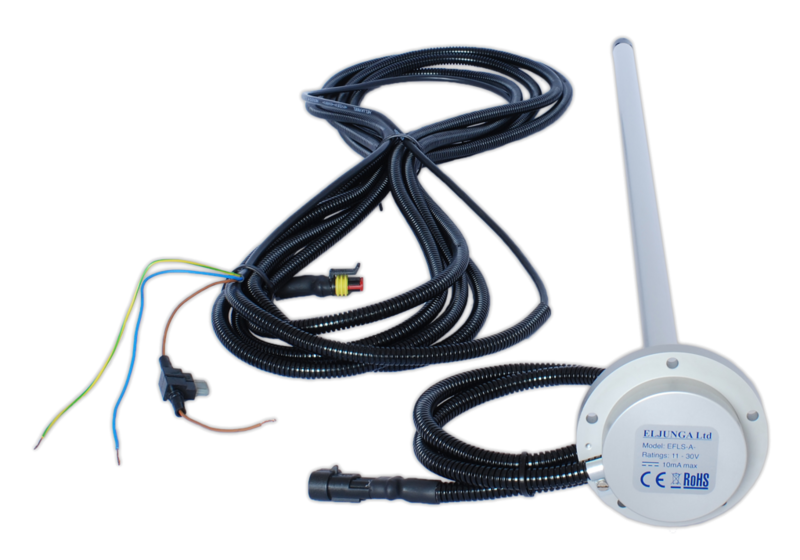 Vendor of Fuel level sensor EFLS-A is Eljunga. EFLS-A analog fuel level sensor detects fuel level in the fuel tank of vehicle, or fuel storage/transportation tank and convert information about current level to output voltage in range of 0.2V...9V. This voltage can be converted in the digital form by the external devices (ECU, data logger, or telematics module). Sensor has temperature compensation (fuel level change cancellation in different temperatures). The connection wires are protected by metal-plastic flexible corrugated tube. Sensors body made from anode aluminum that gives to a product rust proof and lightness besides it matches IP67 standard which determines dust and water protection to all electronic components. Dust and water protection standard IP67.